A huge cheesecake makes a lovely centrepiece, but we think these pretty individual cheesecakes are even better for small gatherings. They look elegant in their own neat pots, and everyone loves their own whole dessert. The quantities needed are smaller and any leftover pots are easier to store. Not only that, but portion control is easier. I won’t claim that these are healthy, but making individual portions does avoid the temptation to go back for one more slice. This is a great recipe for relaxed entertaining. It only takes 20 minutes hands on time to prepare (though you do need to allow time for the cheesecakes to chill). There is no baking, so no need to worry about the cheesecake cracking, and serving in pots helps to take the pressure off, as the filling can’t run or collapse. Any small ramekin-type dish is suitable, but glass is prettier because you can see the layers. The little glass containers that ready-made puddings come in are ideal. Step one – Put 6 (100 g) chocolate digestive biscuits in a bag and bash into crumbs with a rolling pin. Step two – Place the crumbs in a bowl with 2 tablespoons of melted butter. Step three – Mix the crushed biscuits and butter together. Step four – Divide between 4 small ramekin dishes (about 150 ml) and press the biscuit mix down with the back of a teaspoon to form a flat base. Step one – Place the cream, icing sugar and vanilla in a bowl. Whip until the mixture forms stiff peaks. If you don’t have an electric whisk, you can use a manual one. 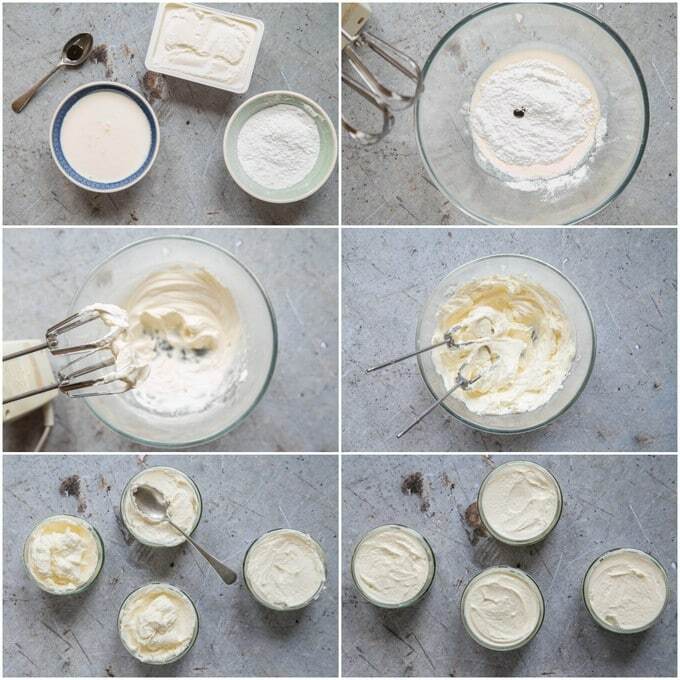 Step two – Add the cream cheese and gently mix it in, using the mixer on the lowest speed, or using the beaters manually. It is important not to go too fast or the cheesecake will not set and may be too runny. Step three – Divide the mixture between the 4 ramekins on top of the biscuit base. Step four – Smooth out the cheesecake filling with the back of the spoon, leaving room for the ganache layer. Step one – Put a tablespoon of double cream (about 15 ml) in a small saucepan. Chop up 2 creme eggs and add to the pan. Step two – Set the pan on a low heat. Stir with a silicon spatula, using it to scrape the bottom of the pan as the chocolate melts. Remove from the heat when you have a smooth ganache. Step three – Allow the ganache to cool slightly. Then pour over the 4 cheesecakes. If necessary, use a spoon to spread the chocolate to the edge of each ramekin. Step four – Chill the cheesecakes in the fridge for at least 2 hours before serving. Serve topped with a quarter of a creme egg and some mini eggs. Despite the long list of instructions, these cheesecakes are very easy to make and only contain 8 ingredients. Breaking the recipe down into three stages, base, cheesecake and ganache, makes the process even easier. Vary the biscuits in the base – I used dark chocolate digestives, but milk or plain digestives, Hobnobs or shortbread would all be delicious. Make it gluten free with GF biscuits in the base. 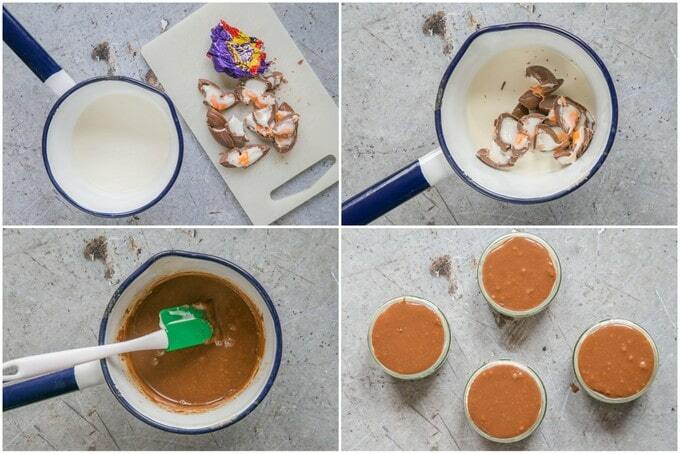 Garnish with the 1/4 creme egg just before serving – If you cut the eggs too early, the fondant will run everywhere. To get a clean cut when slicing the eggs, warm the knife in a mug of just-boiled water. If your presentation is important, have a few spare creme eggs to hand. Any that shatter when being sliced can be kept and used in my no churn creme egg ice cream. Cheesecakes will keep in the fridge for 3 days. 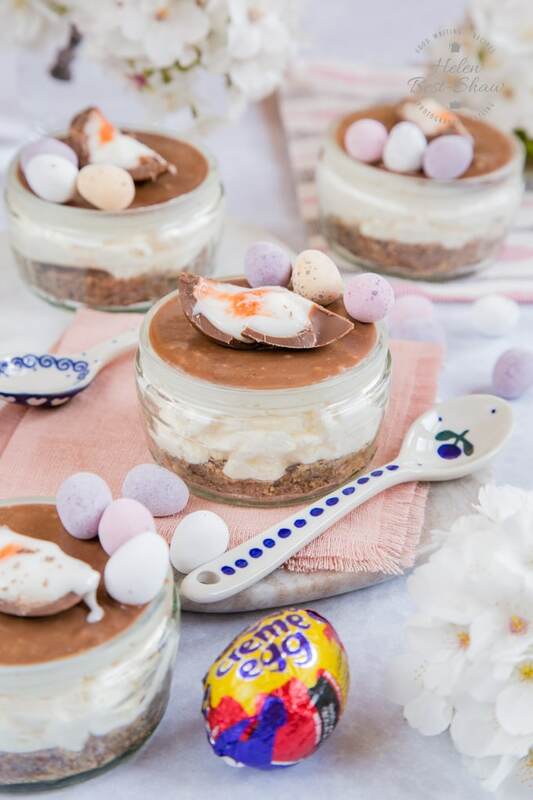 If you try this Individual Cadbury Creme Egg cheesecakes please tag #FussFreeFlavours on Instagram or Twitter. It is amazing for me when for me when you make one of my recipes and I really do love to see them. You can also share it on my Facebook page. Please pin this recipe to Pinterest too! Thanks for reading Fuss Free Flavours! 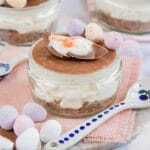 These quick and easy no-bake cheesecakes are perfect if you are only catering for a few this Easter. 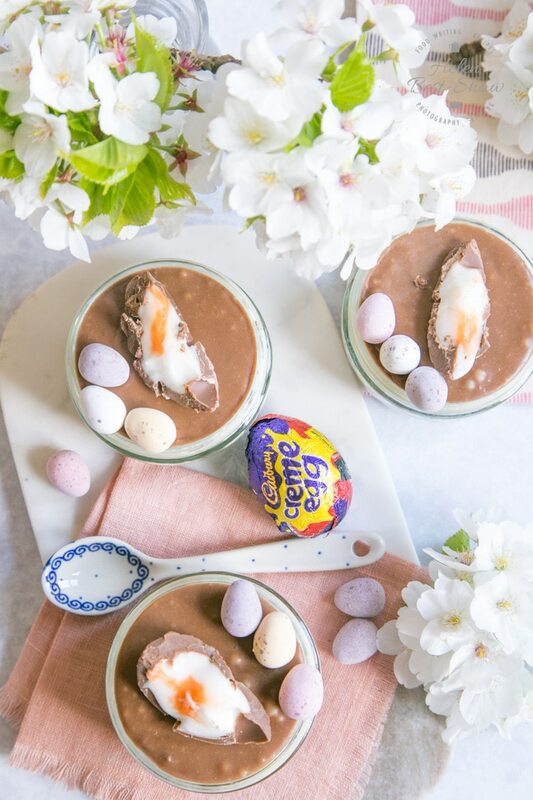 Layers of chocolate biscuit base and smooth, creamy vanilla cheesecake are smothered with a sweet and sticky Creme Egg chocolate ganache, topped with chopped creme and mini eggs. 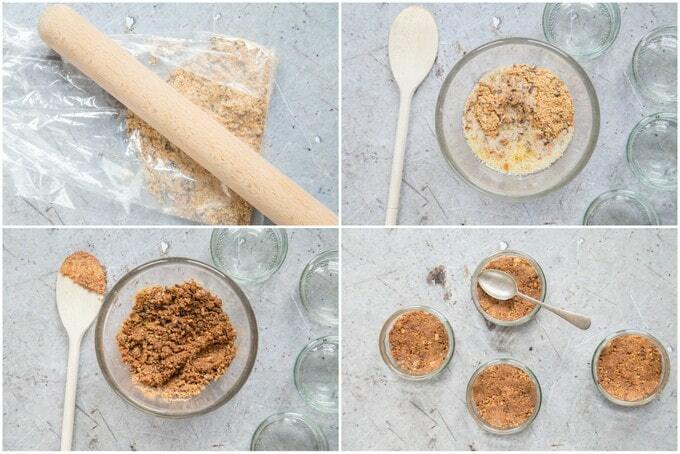 Put the biscuits in a plastic bag and bash into crumbs with a rolling pin. Place the crumbs in a bowl with 2 tablespoons of melted butter. Mix the crushed biscuits and butter together. Divide between 4 small ramekin dishes (about 150 ml) and press the biscuit mix down with the back of a teaspoon to form a flat base. Place the cream, icing sugar and vanilla in a bowl. Whip until the mixture forms stiff peaks. Add the cream cheese and gently mix it in, using the mixer on the lowest speed, or using the beaters manually. It is important not to go to fast or the cheesecake will not set and may be too runny. Divide the mixture between the 4 ramekins on top of the biscuit base. Smooth out the cheesecake filling with the back of a spoon, leaving room for the ganache layer. Put a tablespoon of double cream in a small saucepan. Chop up 2 creme eggs and add to the pan. Set the pan on a low heat. Stir with a silicon spatula, using it to scrape the bottom of the pan as the chocolate melts. Remove from the heat when you have a smooth ganache. Allow the ganache to cool slightly. Then pour over the 4 cheesecakes. If necessary, use a spoon to spread the chocolate to the edge of each ramekin. Put in the fridge to chill for at least 2 hours before serving. Top with a 1/4 of a creme egg and some mini eggs. Wait until just before serving to cut up the egg to top the desserts. Vary the biscuits in the base - I used dark chocolate digestives, but milk or plain digestives, Hobnobs or shortbread would all be delicious. Garnish with the 1/4 creme egg just before serving - If you cut the eggs too early, the fondant will run everywhere. To get a clean cut when slicing the eggs, warm the knife in a mug of just-boiled water. If your presentation is important, have a few spare creme eggs to hand. Any that shatter when being sliced can be kept and used in my no churn creme egg ice cream).